Many detached houses have private driveways. In suburban and rural areas, nearly all do. Improving and maintaining these rights-of-way is a necessary but oft-overlooked cost of homeownership. And it’s not a trivial expense. The average asphalt driveway costs about $4,400 to install, according to HomeAdvisor. Periodic resealing costs $400 a pop, on average. Though they’re more durable, concrete driveways are even pricier to install. For less than a tenth of the cost of the typical asphalt driveway, this year, my wife and I got ourselves an attractive, completely functional gravel driveway that should last years with minimal upkeep. If you get going today, you too could be the proud owner of a beautiful gravel driveway by next week. Here’s what you need to know about gravel driveways’ advantages, disadvantages, costs, and installation procedures. First, let’s outline the economic and practical arguments for gravel. Less Runoff. On gentle grades, gravel moderates storm runoff. That keeps debris off public streets and sidewalks, keeps leaves and other clog-forming materials out of storm drains, and limits surface water pollution. In other words, it’s good for your local infrastructure and the natural environment. Less Ponding. Gravel reduces surface ponding. In cold weather, surface ponding exacerbates the destructive impacts of the freeze-thaw cycle, shortening solid driveways’ useful lifespans. If your driveway runs along or near your home’s foundation, ponded water inevitably finds its way into cracks and weak points, potentially causing structural issues down the line. This was the single biggest motivator for our gravel driveway project – practically every time it rained we’d notice water draining slowly into the cracks between our driveway and foundation apron. Gravel is more affordable than asphalt or concrete, and it’s not particularly close. Asphalt driveways cost $2 per square foot at minimum; $4 to $6 per square foot is more realistic. Concrete driveways cost more still. Gravel is a low-maintenance material. It’s basically inert, it responds well to freezing and thawing, and it’s easy to repair without professional help. 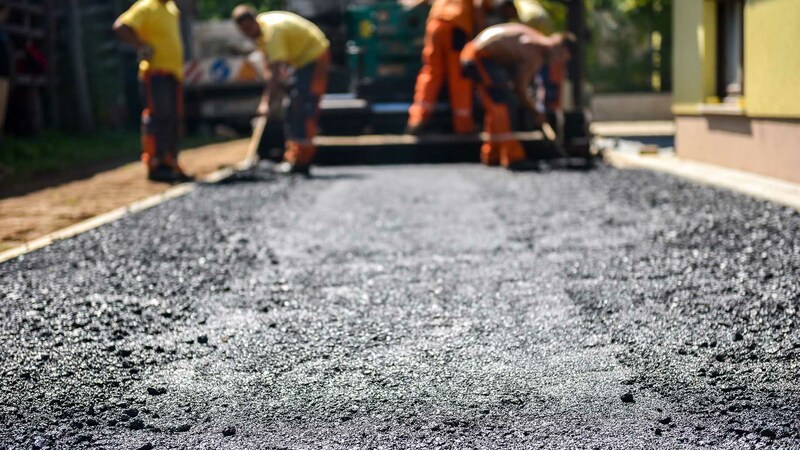 By contrast, asphalt requires resealing every three to five years, depending on climate and intensity of use. That’s a $400-per-job investment, on average, and more for longer driveways. It’s a messy job too – one best left to the professionals. In theory, gravel lasts indefinitely. In practice, it washes away or subsides enough to require periodic resurfacing. But a level, well-maintained gravel driveway can last decades without a complete overhaul. When the time does finally come, it’s a lot cheaper. Gravel’s aesthetic is more utilitarian than arresting, but that’s not necessarily a bad thing. Depending on the color and texture, gravel blends well with a wide variety of home styles, exterior colors, and landscaping elements – from xeriscaping and other native landscapes to formal gardens. Gravel is easy to install on your own. If you have a commercial driver’s license, you can complete the entire project without any outside help. If not, the only “professional” you need to retain is the person who drives the gravel truck up your driveway. Paving an asphalt or concrete driveway is technically possible without professional help. But it’s a far more complex, risky affair. I certainly wouldn’t try it, nor would I recommend it to anyone without proper training. Now for the bad news: the downsides of gravel driveways. Gravel lacks the aesthetic appeal of paving stones and the crisp, uniform appearance of asphalt and concrete. It’s cheap, and it looks it. If you’re looking to improve your home’s curb appeal, and especially if you’re preparing to list your house for sale, a more expensive option may be a worthwhile investment. Pro Tip: Looking for DIY projects that actually pay for themselves over time? Check our roundup of easy home improvements that help reduce homeownership costs. Sad to say, gravel driveways aren’t popular with everyone. 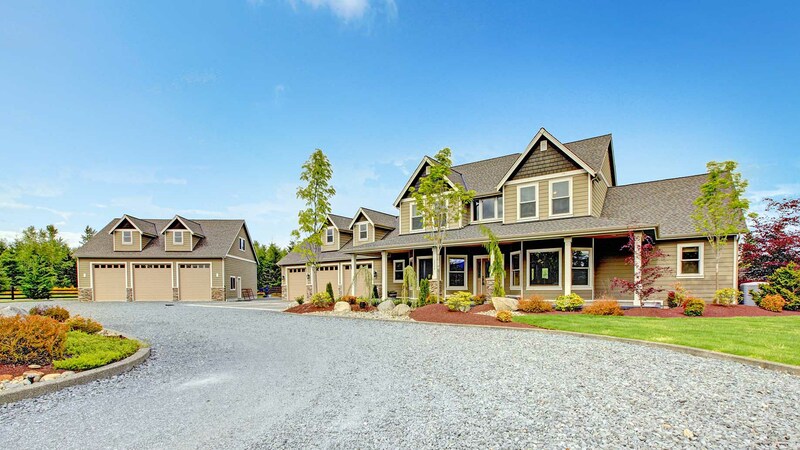 If you live in an upscale community or belong to a homeowners’ association, your driveway project may be restricted or stymied altogether by legally enforceable covenants (regulations). Your HOA’s bylaws might mandate a certain type of driveway surface, for instance – say, black asphalt or stone pavers. Before you spend any money on your gravel driveway project, make sure it won’t go to waste. Dump trucks are big. When they dump their loads, they get even bigger. Actually, they get taller – their beds lift up to create a slope down which whatever they’re carrying can slide. With its tailgate fully engaged, the typical dump truck grows to 16 feet tall. That’s level with your second-story windows. On narrow driveways with side or overhead obstructions, taking a gravel delivery is harder than it should be. This is common in densely built cities, where driveways directly abut houses and aren’t built for anything wider than a standard passenger car. Overhanging eaves further complicate matters – a driveway that’s wide enough to handle a dump truck at ground level might not have enough clearance 10 or 15 feet overhead. If you have a narrow lot, you’ll likely have to block off a portion of your street and get the gravel dumped there. 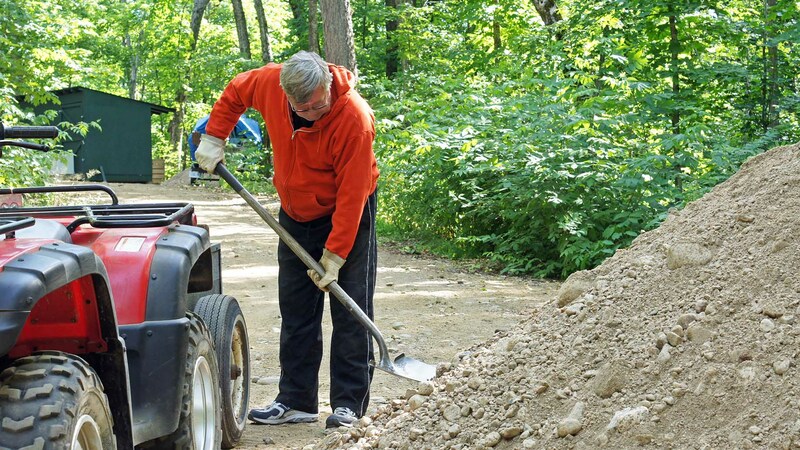 That may require you to pull a permit (or at least notify your municipal government) and will definitely create a lot more work for you, since you’ll need to schlep the gravel up to where it’s actually needed. Gravel driveways are difficult to shovel by hand and even tougher to plow. We’ve given up trying to clear our gravel driveway completely. I basically scrape as much snow as I can off the top and trust our newish tire treads to claw their way up the slope. Our driveway is short, and its slope is brief enough that we can power our way up without much trouble. Homeowners with longer, steeper driveways aren’t so lucky. If springing for asphalt means you’ll actually be able to make it up your hill in the winter, it might be worth the added investment. Careful grading can keep your gravel driveway relatively even for a while, but the killer combination of gravity and heavy use will win out eventually. Wheels inevitably produce ruts and bumps, which get ever sloppier over the years as the driveway’s gravel thins. Before we resurfaced it, our gravel driveway had two deep, parallel scores left by thousands of vehicle transits. The thin gravel cover wasn’t adequate to keep those scores mud-free after rains. In winter, they’d fill with ice and snow for months on end, and take weeks to drain following the spring thaw. I can’t tell you how sick we got of dodging mud puddles, and how happy we are with our fresh, reasonably clean gravel surface today. Let’s drill down into the gravel driveway installation process, step by rocky step. The amount of time you’ll need to invest in your DIY gravel driveway project depends on your driveway’s length and the equipment at your disposal. Working quickly but carefully together, my wife and I were able to complete our single-layer project in about three hours, including frequent rest breaks. (Leveling gravel is surprisingly hard work.) But our driveway is shorter than most. Based on our experience, I’d estimate that dumping and leveling a single gravel layer takes approximately one hour per 15 linear feet. If you need two or more layers, you’ll need to double (or triple) your time allotment and wait at least a few days between blocks. And, if you’re planning to install a drainage system to divert runoff, you’ll need to plan for at least an additional hour per 15 linear feet. Measure Your Driveway. Before you do anything else, you need to know your driveway’s approximate length and width. Within a foot or two is fine, so you don’t have to go overboard. I measured my foot (heel to toe) and carefully paced out our driveway from top to bottom. Multiply width by length to ascertain the approximate square footage. Calculate Your Aggregate Requirements. If you’re building your driveway from scratch, you’ll need at least two layers of aggregate: a finer lower layer and a coarser upper layer. If you’re resurfacing, the coarser upper layer will suffice. Experts recommend at least four inches of gravel per layer. (I’ll be honest: Ours was more like three inches.) Multiply your driveway’s square footage by 0.33 (four inches is one-third of a foot) to determine your cubic footage per layer. Aggregate is generally priced by the ton, so you’ll need to convert. One ton of aggregate generally yields about 40 to 60 square feet at four inches’ depth. That’s about 10 tons of gravel per 500 square feet. Research and Price Out Your Aggregate Options. Next, research your aggregate options. Pay attention to material quality, color, and price. See the “Types of Driveway Gravel” section below for more details on your likely choices. Decide on Delivery or Pickup. Unless you’re licensed to drive a dump truck, or your order is small enough to fit in a vehicle that doesn’t require a commercial driver’s license (unlikely), you’ll want to opt for delivery. We considered making multiple trips in a pickup truck to avoid our vendor’s $99 delivery fee, but after determining that we’d need to make at least six trips and drive about 150 miles total, we decided the time saved was well worth the added expense. Tear Up Existing Vegetation. If you’re building your driveway from scratch, you’ll need to mark off and prepare the ground. Use appropriate landscaping tools to tear up the existing vegetation – a soil rake works well for turf grass, for instance. Turn over the soil to disrupt roots and delay regrowth. On long driveways, this will go a lot faster with an earth mover – though renting one will certainly increase your project cost. Level the Ground. Next, use a leveling tool to smooth everything out. If the ground is soft and fine, a hand leveler ($40 to $50 at your local hardware store) should suffice. On tougher surfaces, long driveways, or steep slopes, a power leveler might be necessary. 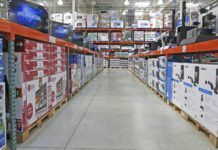 Even low-end power levelers cost $500 to $600 new, so you’ll want to rent one at your local hardware store or home improvement warehouse. Expect to pay $30 to $50 per day. Schedule and Place Your Order. Block off enough time to receive and spread your gravel in a single go – or, at least to spread enough of it to allow your car(s) into your driveway. In my experience, it’s hard to get a delivery on the weekend, so plan accordingly or be willing to pay extra to get your load on a Saturday or Sunday. If you’re doing a multilayer job, leave at least five days between deliveries to allow for adequate packing and settling. Dump and Spread the Aggregate. If your driveway is wide enough, ask the delivery driver to back all the way up to the top. Then, with the back hatch slightly open, have them drive slowly toward the street. The goal here is to distribute the aggregate as widely and evenly as possible before you have to lift a finger to spread it yourself. If the truck can’t fit up your driveway, you’ll have to do more of the work on your own. In either case, you’ll want a wheelbarrow, shovel, and soil rake handy. When you’re done, the gravel surface should be uniformly even along the horizontal axis. Pack It Down. On flat or gentle slopes, simply driving the length of your driveway should be enough to pack down the gravel. (It worked for us – a week in, you had to really work to dislodge individual stones with your foot.) On steeper slopes, you’ll need a tamper – hand-powered or gas-powered, your choice. Hand tampers are cheap: $20 or $30 at your local home improvement warehouse. Gas-powered tampers cost hundreds of dollars new, so you’ll want to rent – $30 to $50 per day, ballpark. Install Drainage. If your driveway is steeply sloped or close to your house, you’ll want to install a drainage system that reduces gravel loss, ponding, and potential damage to your driveway or foundation. Hunker has a good primer on a basic French drain system, which can be as simple as a gravel-lined trench that directs water away. If you’re already taking point on your driveway project, building one of these yourself is well within your capabilities and shouldn’t dramatically increase your project budget (you’ll need an extra ton or two of gravel and possibly some PVC pipe). More sophisticated or aesthetically pleasing drains may require professional assistance and could significantly increase your project costs. For instance, drains incorporating paving stones or concrete can easily cost $5 per square foot – more than the driveway itself. Spread and Fill Gravel As Necessary. Moving forward, you’ll need to perform periodic maintenance to keep your driveway’s surface even and stable. For a while, using a soil rake to fill in sparse patches and driving over loose areas will suffice. Eventually, you may need to use a shovel or auger to break up bumps or fill in ruts. On a DIY gravel driveway project, gravel itself will likely be your single largest expense, but it’s not the only cost you’ll need to worry about. Aggregate is almost always mined locally, so the availability of various types can change significantly over short distances. This 1988 U.S. Geological Survey report provides an exhaustive overview of the United States’ aggregate resources. As you can see from the map on page 10, limestone is the country’s most common aggregate material, followed closely by sandstone, granite, and trap rock. My wife and I live in Minneapolis-St. Paul, near the border between regions 3 and 4 in the USGS map. Our aggregate mix here in Minnesota is pretty representative of what’s available across a broad swathe of the United States, but most of our neighbors’ driveways are crushed limestone. After briefly researching readily available alternatives, we settled on that. Class 5 Gravel. If you’ve ever driven on a gravel road, you’ve seen this stuff in action. Its color and texture vary from place to place, but it’s your basic, no-nonsense road base product. It’s cheap too: $7.95 per ton. Class 5 Limestone. Class 5 limestone ranges in color from off-white to light tan. It’s more attractive than Class 5 gravel and usually comes in a couple different gauge options – sub-1″ and 1″-1.5″. It’s the main ingredient in our gravel driveway. It costs more, but you get what you pay for: $21.95 per ton. Screened Class 5 Limestone. Regular Class 5 limestone includes smaller-gauge material – sand, silt, random detritus. Screening removes this stuff, leaving only clean rocks: $27 per ton. Crushed Rock. This small-gauge material (usually less than 0.75″) is a mix of whatever’s locally available. Its fineness makes it more vulnerable to erosion on moderate to steep slopes. However, it’s a good base layer for multilayer driveways: $18.40 per ton. Screened Rock. Similar gauge to screened Class 5 limestone, different appearance: $18.40 to $27 per ton. Clear Crushed Gravel. This material comes in various gauges, from less than 0.75″ to 1.5″ or greater. Common colors, depending on location, include off-white, gray, tan, rust red, and slate blue: $18.40 to $27 per ton. Professional landscaping companies may offer costlier, more attractive types of gravel not included on this list. And remember that you may have access to more novel regional options – for instance, crushed shell aggregates in some coastal areas. Type of Gravel Used. Gravel prices vary widely – see above. Aesthetically pleasing aggregates generally cost more than utilitarian ones. Upscale gravel can easily double your project’s material costs. Tools Used. 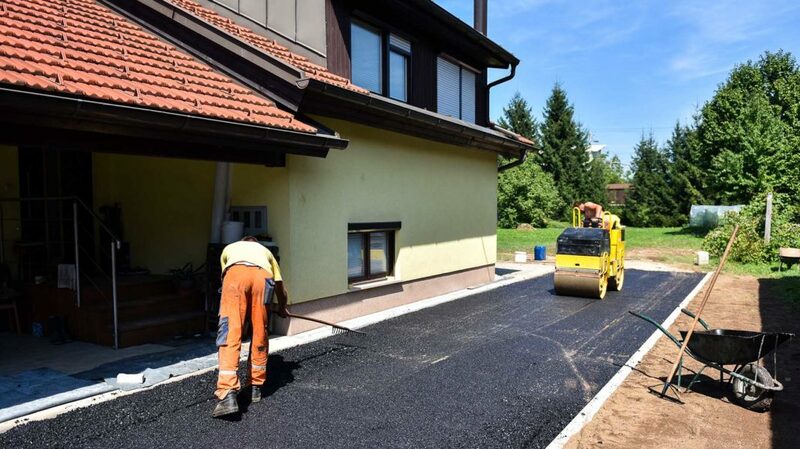 If you want to do your driveway install right, but don’t have the budget to hire professional help, professionalizing your project with grading and tamping tools is the next best thing. Unless you’re starting a landscaping business, it’s overkill to buy them new – that’d add hundreds to the cost of your project. Still, daily rentals from your local hardware store could set you back $30 to $50 per tool. Length and Area of Driveway. 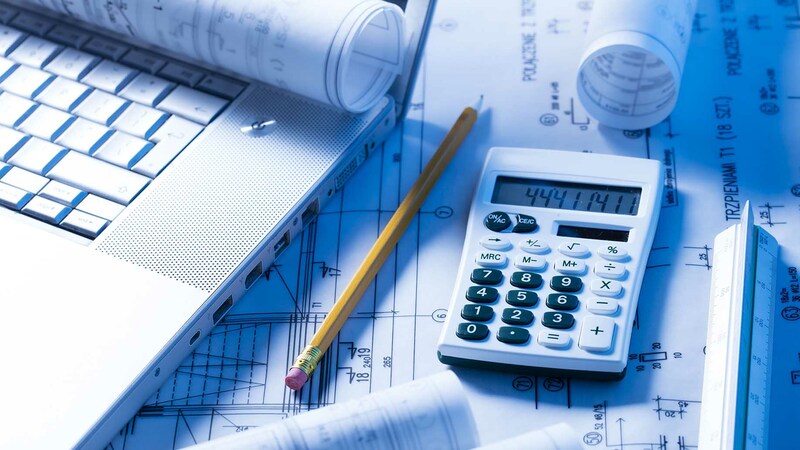 This is a major, unavoidable contributor to your project’s budget. Long driveways, and driveways with wider outdoor parking areas, cost more to build and resurface. We spent about $130 for six tons of Class 5 limestone on a 45-foot, single-layer driveway. Had we needed a comparable amount of crushed rock for our base layer, our total aggregate cost (before delivery) would have come to just under $250. On a 90-foot driveway, the same mix would cost nearly $500; on a 180-foot driveway, more than $900. Multiply accordingly. Delivery. Delivery is a necessary evil, even for committed DIYers. Every aggregate provider we researched was willing to deliver within a 50-mile radius of its headquarters. Round-trip delivery charges ranged from $99 to $125 per hour, per truck, starting when the truck rolled off the aggregate lot and ending upon its return. We used a nearby company that was able to complete the job in an hour, so our total delivery fee was just $99. If your load comes from farther away, or requires multiple trips, you’ll pay more. Small- to medium-sized jobs should only require a single load per layer – dump trucks can fit a lot in their beds. Project Scope. Our driveway is a single layer of crushed limestone covering a 45′ x 8′ space. We didn’t add a second layer. We didn’t install a sluice or even dig a drainage ditch. And we didn’t use professional tools or help. In other words, most gravel driveway projects are more involved than ours. Expect a second layer to add at least 50% to your material costs, rented tools to tack an extra $50 to $100 onto your budget (assuming you complete the work in a single day), and a gravel-lined sluice with paved-stone edges to cost at least $150 extra (depending on length). Professional Help. Professional help isn’t cheap. If you just need help spreading gravel, you can probably find a handyperson for less than $25 per hour, depending on prevailing wages in your area. You’ll pay more for someone with the know-how to grade your driveway or install drainage elements – at least $40 per hour, and more if you go through a landscaping company (whose work should be higher-quality than an itinerant hand’s). Go With Cheaper Aggregate. As the price list above demonstrates, not all aggregate is created equal. Price generally rises in relation to quality and aesthetic appeal, but if you’re not particularly concerned about your driveway’s appearance or vulnerability to erosion (which isn’t as big of an issue on a flat or slight slope), go for a cheaper option. Get Your Friends and Family to Lend a Hand. Even with professional tools, spreading and compacting gravel is taxing work. Entice your friends, family members, or neighbors to help with low-cost rewards, such as refreshing beverages and a catered lunch. Pizza works well, in my experience. Extra hands will make the project go faster, saving valuable time on your end and quashing any temptation you might feel to hire professional help. Borrow Grading and Compacting Tools. Why rent when you can borrow? If there’s a tool-lending library in your area, you can probably reserve your project’s grader and compactor tools at no out-of-pocket cost. Skip the Professional Tools Altogether. Swap the fancy equipment for old-fashioned elbow grease. Have your delivery driver spread as much gravel as possible during the dump, then use a soil rake to distribute it evenly along the entire length. Drive over the new surface a few times to pack it down, and it should be ready for regular use. Hold Off on Drainage. You can probably get away without drainage features on flat and slightly sloping driveways, at least temporarily. Keep watch on your project during and after the first few soaking rains following the installation and reassess if warranted. Use a Rewards Credit Card to Finance the Project. If you have solid credit, use a rewards credit card to marginally (or significantly) reduce the final cost of your project. The typical cash back credit card earns 1% to 2% cash back on most or all purchases – a meaningful return, to be sure. You get much more bang for your buck when you leverage your project to meet a new credit card’s sign-up bonus spend requirement. My driveway project accounted for about half the required sign-up bonus spend on my new Chase Freedom Unlimited card, back when that card had a spending-based sign-up bonus. (Now, new cardholders earn 3% cash back on all purchases in the first year, up to $20,000 spent.) Thanks to the project, I snagged a hefty bonus that offset nearly 70% of the project’s total cost. Pro Tip: Frequent travelers can take advantage of some of the best sign-up bonus offers around. Check out our list of the best travel rewards credit cards for sign-up bonus offers worth $500 or more. When you own a detached single-family or multiunit house, your property maintenance responsibilities don’t end at your threshold. You’re not just the king or queen of your personal castle – you’re also lord of the outdoor domain within your property lines. Installing a gravel (or asphalt, concrete, or stone) driveway is just one of the many projects you’re likely to tackle outside the walls of your house during your tenure as a homeowner. Are you planning a gravel driveway project in the near future? Will you go the DIY route or hire a professional to help?